Hi there! 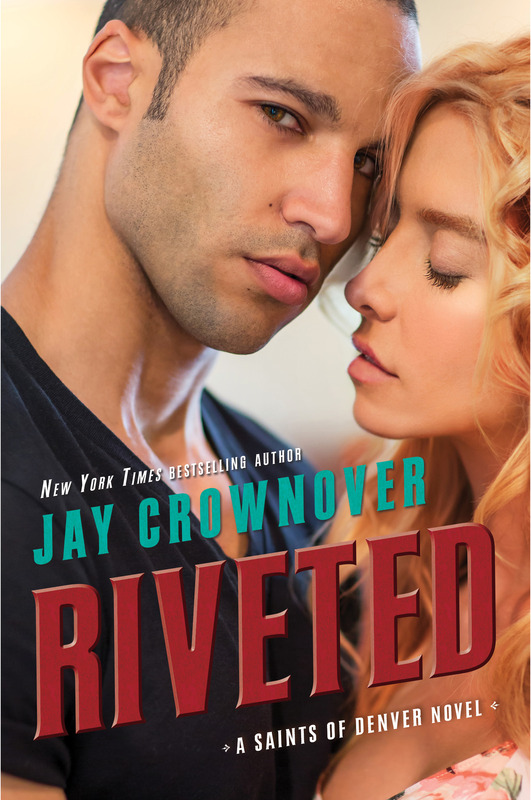 Today I’m sharing a review for a brand-new contemporary romance from Jay Crownover. RIVETED is the third book in the Saints of Denver series. Though I’ve read BUILT and CHARGED, this romance follows a new couple, and is fully enjoyable on its own. Dixie Carmichael is a woman bent on finding the perfect man to stand beside her. She’s decided that man is Dashel Church, but Church isn’t having it. See, he’s a man on his own, destined to live without love. All the women he’s ever loved died young, and he won’t risk his heart. Recognizing a lost cause when she sees one, Dixie backs off from Church, and takes her future by the horns–getting her app-dating on. Expect disastrous results. Church is a mixed-race man, who’s always had an inferiority complex. His young, unwed mother was disowned because her racist parents wouldn’t accept Dashel as a grandchild. Then, after his mother married another man, he wasn’t sure he would be accepted. While his stepfather was fantastic, Church’s mother died while he was a young teen–and he’s been emotionally adrift for a while. While he may desire Dixie, he doesn’t feel worthy of her generous nature, and goodwill. Plus, Church is a loner, and a roamer. He’s not been back to his small Mississippi town since he went to war more than ten years ago. Thing is, one of his dearest childhood caregivers is ill, and begging for him to return…with the woman he said he’d been dating in Colorado. This is a big, fat lie–Church hadn’t been dating anyone, he was too torn up by his military experiences to go home. He does have a definite attraction to Dixie, and he knows she’s the kind of friend who’ll do whatever she can to help him out; even drive two days on a motorcycle from Denver to Mississippi. It’s a little exploitative–Church knows she’s attracted, and he kind of appeals to that side to get her to agree. Being together in close quarters gets Dixie where she wants to be, without the satisfaction of Church’s heart being engaged–at first. He’s definitely super protective, and Dixie’s a gal to admire for lots of men. It soon becomes clear that someone is targeting Church, to get him away from Dixie–and that leads to some serious conflict. We also have the “Church makes amends to his family” plotline which is tender and the sexytimes are satisfying. Expect a lot of brooding on Church’s part, and lots of sunshine from Dixie–that gal could make a gargoyle smirk, I think. Plus, a few of Church’s family getting caught in the crossfire of a lunatic, and huge changes for a woman who finally gets her heart’s desire. There’s an HEA ending for Church and Dixie. As for the series, we get an inside look at Wheeler’s dilemma–which began unfolding in the previous book, CHARGED, and I’d expect that guy to find a new love pretty darn quick. Interested? you can find RIVETED on Goodreads, Amazon, Barnes & Noble, iBooks, Kobo, and Google.